Der himself with an Irish colleen, well satisfied after her Irish breakfast. 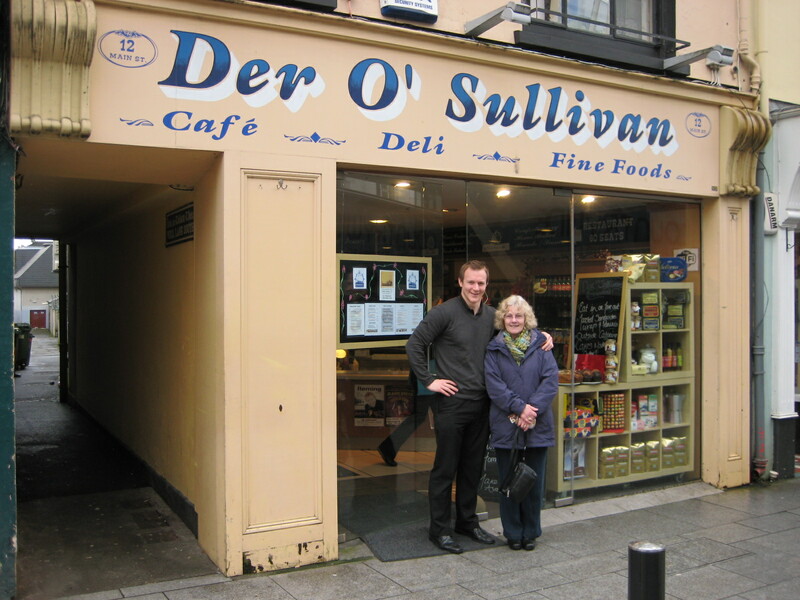 If you want a really good Irish breakfast in Killarney then there is no better place than Der O'Sullivan's in the main street. This picture may give you the impression that this is a very small restaurant but it does extend back quiet a bit and there is plenty of room for larger groups. The front of the shop is a deli where you can buy some really tasty take away foods. The food is prepared after you order it so that it comes up to you fresh and tasty. The quality of the bacon and the sausages and meat puddings is top class and the tea and coffee likewise. The portions are large and you will not need to eat any more until evening if you have a breakfast here. There is also a great choice so that you do not have to have the traditional Irish breakfast if that is not your thing. I highly recommend this place so give it a try if you are in Killarney. The main town centre in Killarney yesterday. 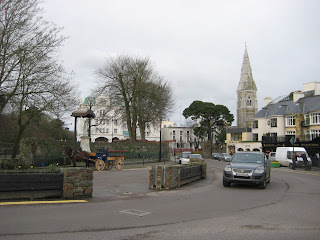 The white building in the background is the Killarney Plaza Hotel. 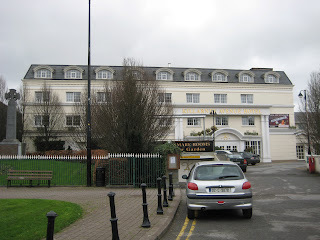 This is one of my favourite hotels in Killarney. It is a four star and has a lovely leisure centre with a gym, spa, and pool. The rooms are quality and the staff are always pleasant and helpful. The food here is also quality and they provide great bar food all day from a really nice menu. Try the Lamb shanks....they are delicious. The dinner in the evening in the main restaurant is exceptional but you had better have an appetite as the portions are huge. The steaks are really good and i also love their duck. Fish is also really good here and salmon steaks are always on the menu. These are always very popular with my guests and Irish salmon is real quality. This is the Killarney Avenue Hotel, a sister hotel of the Plaza.It is a much smaller and more homely hotel than the Plaza, but it is really nice and less expensive. The food here is also quality food and their all day bar food is excellent and at a great price and with large portions.This hotel is located right in the heart of the town. Today was a miserable day here but we cannot complain as we have had such lovely mild weather this year so far and are blessed compared to Britain and mainland Europe where they are enduring horrific snow and freezing temperatures. We have had none of this and it is quiet amazing that we have escaped as we are right on the fringe of it and just a short few miles from the British mainland. Could it be that we are in for a really nice Summer this year? How nice that would be. In the meantime we should enjoy the mild spell that we are experiencing. Today was an exception as it rained a lot and it was miserable. Maybe we have just been spoiled lately. 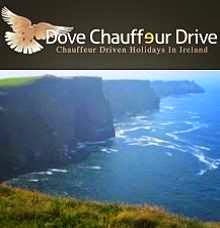 If you are planning on coming to Ireland this year on vacation why not contact me for information. Better still, why not come and tour with me.